I am so obsessed with this movie! In celebration of this week’s release of Wreck-It Ralph on Blu-ray Combo Pack, why not head to the arcade this weekend with your family to see what intergenerational fun can be had! Kids can learn about the classic games that their parents played as kids and young ones can share their latest tricks and tips with their folks! Everyone is bound to be a winner! Also, check out the bonus clips below featuring Chris Hardwick explaining some of the fun items you may have missed in the movie like Hidden Mickeys and where to find Walt’s Birthday! Wreck-It Ralph on DVD Today!!! Check Out These Great Clips, Trivia, and More! I have to say that Wreck-It Ralph is my favorite Disney movie. I might even go as far as saying it is my favorite movie in general. I just love it. And what’s not to love. Nostalgic video games, a lovable “Bad Guy”, and an adorable “glitch”. I was honored to be able to see a sneak screening before the movie was even completed when I went to LA this past summer as part of a Disney Blogger’s Press Event and toured the Disney Animation Studio. And I was even more blessed to be able to try my hand at doing a voice-over for the movie at the same event. Maybe that’s why Wreck-It Ralph has such a place in my heart. I was so excited when the DVD arrived the other day. I am not sure who was more excited, my girls or me. We watched it several times since we received the DVD. You can see more of my Wreck-It Ralph review here. 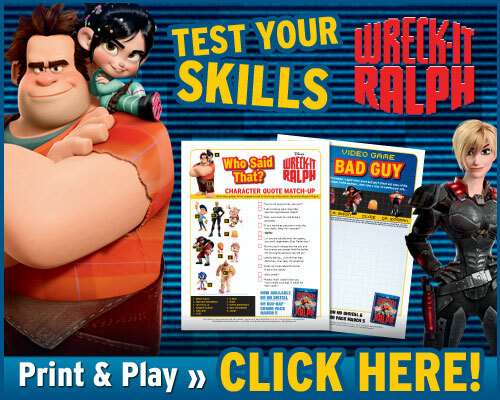 In celebration of today’s release of Wreck-It Ralph on Blu-ray Combo Pack, are you and your family ready to test your bad guy skills? First check out the behind the scenes clips straight from Bad-Anon meetings to get inside the bad guys’ heads. Then flex your memory muscles in the character quote match-up! Now that you’ve proven yourself, get creative and design your very own bad guy! 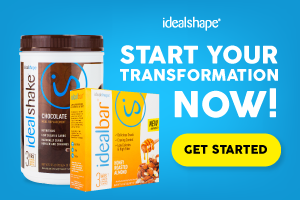 Feeling like a winner? 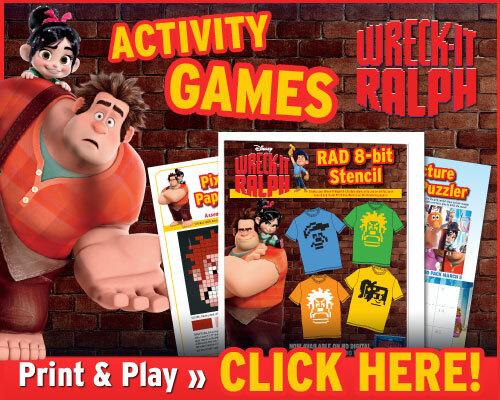 Check out the Ultimate Wreck-It Ralph Quiz below! This section includes random questions on the hit movie and its video game characters. Put your thinking cap on and get to work! In what year was the arcade game Fix-It Felix Jr. first plugged in? Who gave Fix-It Felix, Jr. his magic hammer? In the movie, Ralph attends a special meeting alongside Zangief and Bowser. What’s the name of the group? What is the color of Ralph’s eyes? At one point in the story, Ralph meets an orange ghost from PAC-MAN. What is the ghost’s name? After his meeting, what colorful fruit does Ralph take back to Game Central Station? Ralph gives a piece of fruit to an arcade character in Game Central Station. Who? Who does Fix-It Felix, Jr. think will be fashionably late to the penthouse party? What color baseball cap does Fix-It Felix, Jr. wear? What is the name of the Nicelander that made the party cake? How many quarters do you need to play Hero’s Duty? Can you name the arcade in the movie? What word is written on the medal from Hero’s Duty? Can you name the candy-cart racing game in the movie? Who is the ruler of the kingdom made entirely of candy? What color is Sour Bill? What’s written on the mat outside the candy castle? Who is the best man at Fix-It Felix, Jr.’s wedding? SECTION TWO: WHO SAID WHAT? 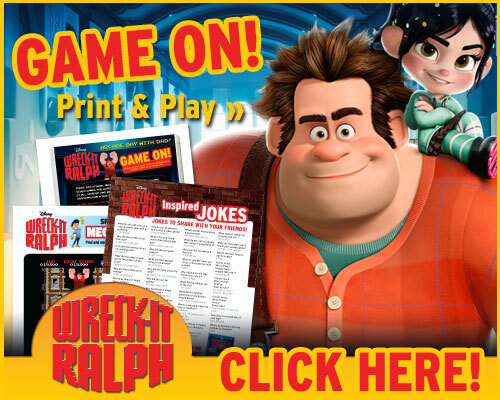 Can you match up the movie quotes with the correct characters from Wreck-It Ralph? You know you can do it! How well do you know the characters, cast and crew of Wreck-It Ralph? Find out by answering these tricky teasers… Good luck! Can you name the actor who provides the voice of Ralph in the movie? Who is the Director of Wreck-It Ralph? What is the full name of the Sugar Rush character voiced by Sarah Silverman? Which American actor provides the voice of Fix-It Felix, Jr. in the movie? QUESTION NINETEEN: A vomit and a burp! QUOTE TWO: Fix-It Felix Jr.
Uh-oh! You’re not the most sharp-eyed viewer of Wreck-It Ralph – but don’t let that put you off. Why don’t you watch the movie a few more times and take the test again? We’re sure you’ll beat your old score with ease next time. Good luck, gamer! Congratulations on your amazing high score! Are you best friends with Ralph, Vanellope and Felix? Well, you should be with your expert knowledge of the movie. You’ve earned a top spot on the leaderboard hall of fame for your efforts. Game on! In anticipation of Disney’s WRECK-IT RALPH releasing on Blu-ray Combo Pack on Tuesday, March 5th, turn your world into a classic arcade game this weekend with these fun 8-Bit projects! Use the printable stencils to jazz up everything from clothes to book covers! Then break out the scissors for a Pixilated Paper Craft and a Picture Puzzler featuring all of your favorite characters! Bonus Clip: Creating the 8 Bit World – The animators discuss creating the different worlds within Wreck-It Ralph and what it was like asking some of the best animators in the business to ignore years of training to go back to linear worlds and pixelated characters. Check out these awesome bonus clips from the new movie Wreck-It Ralph out on DVD March 5th! I hope you enjoy them as much as we did! Wreck-It Ralph is my favorite movie. I am so excited that I was able to see it in California at the Disney Movie Studios before it came out in theaters and then again in theaters with my family. I’ve been waiting for it to come out on video and I was so excited when my preview copy arrived at my door this afternoon. I am sure I will be watching it a lot this weekend with my girls! Film Clip: Bad-Anon – Ralph attends his first Bad-Anon meeting to talk about his feelings. Film Clip: Game Central Station – Ralph makes his way through Game Central Station. Film Clip: Lickety-Split – Vanellope shows off her new go-cart, Lickety-Split. Wreck-It Ralph Printable Valentine’s Day Cards! Sometimes we don’t have the best way with words. 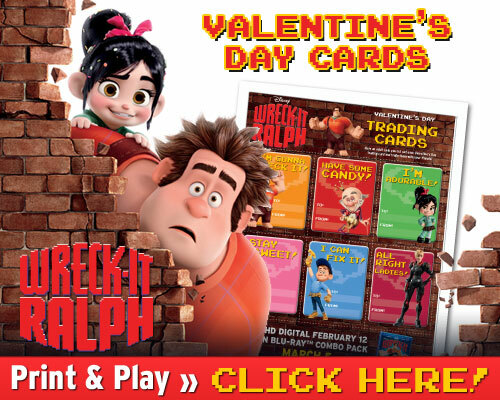 This Valentine’s Day help your kids say something sweet to their friends with Wreck-It Ralph Valentine’s Cards! Wreck-It Ralph will be available on HD Digital 2/12 and on 3D Blu-ray Combo Pack on 3/5! I can’t wait for Wreck-It Ralph to come out!!!! There were so many highlights from my trip to LA last month. I had an amazing time at the star studded movie premiere of Frankenweenie, interviewing the child actors of Frankenweenie, and seeing Frankenweenie in the theater. I loved going behind the scenes at the Disney Annimation Studio and learning how Wreck-It Ralph was created. There were so many “once in a lifetime” moments on my trip but I was especially excited to have the opportunity to go into the same recording booth that Sarah Silverman and John C. Reilly recorded their lines for Wreck-It Ralph and try my hand at doing a voice over. It was a little scary at first with all the other bloggers watching. I will say that I wasn’t the first to volunteer. It took a little while to get up my nerves but I am so glad I did it. Vanellope Von Schweetz is my favorite character so I am so grateful that I was able to get a chance to be her even if just for a moment. I LOVE this movie. Check back soon for my movie review but I am sure you will love it, too! Come back next week to check out my interview with Wreck-It Ralph Director Rich Moore and Producer Clark Gregg!